"Pannus in dogs is a condition where your dog's immune system attacks the cornea. Symptoms include changes in color and the appearance of red blood vessels. While there is no cure for the syndrome, it can be controlled for the life of your dog. Failure to treat the condition can result in blindness." The cornea is a membrane that covers the colored part and white part of the eye. Canine keratitis is a syndrome where the cornea becomes inflamed and discolored (corneal pigmentation). Pannus causes tissue to accumulate on the surface of the eye and cholesterol to form inside the cornea. The cause of this condition is unknown although there are certain factors that are thought to bring on the condition such as ultraviolet light and altitude. Pannus is considered an "immune-mediated" disease where the body is producing antibodies directed against the cornea. The disease appears to more severe in younger dogs. If left untreated, pannus can result in blindness. Sympoms of CSK are discoloration in the eye (pigmentation) and the appearance of blood vessels in the eye (vascularization), usually on the sides of the eye. This starts in a part of the eye and then spreads to the entire eye. 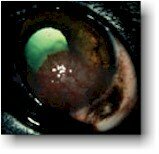 One type of CSK impacts the third eyelid (called atypical pannus or plasmoma). Most of the time diagnosis is based on an observation of the symptoms and if your dog is on the list of breeds that are more likely to suffer from the syndrome. There is no cure for Pannus. The goal of any pannus treatment program is to control the disease and keep it from getting worse. Topical steroids are effectively used to suppress the immune response that causes pannus. Some veterinarians will also prescribe topical cyclosporine therapy. Injections of subconjunctival steroids can be used for several wounds or lesions on the cornea, although this treatment lasts for an entire month. Pannus removal can be achieved with surgery. Surgery can be used in some cases to remove diseased portions of the cornea including cryosurgery (destruction of diseased cells with extreme cold) or Superficial keratectomy where select cells are removed. Radiation is effective in advanced pannus treatment. Treatment needs to continue for your dog's entire life, although you may be able to pull back on the frequency of treatment. Younger dogs are more difficult to treat and may be resistant to some of the more common therapies. Treatment also varies based on the severity of the disease. Your veterinary ophthalmologist will need to monitor the condition to ensure that it does not get worse.